The story of the Victorian Tapestry Workshop from its formation in the mid 1970s to the present; a story which runs parallel with the history of the visual arts in Australia over the last quarter of the twentieth century. It's a story which unfolded among over 300 contemporary Australian and international artists. The book's author, Sue Walker, was the founding Director of the Workshop and its leader for 28 years. She tells of a journey of discovery in which hundreds of Australian artists worked with enthusiastic and highly trained weavers to breathe new life into an ancient art; this in a country that had no history of tapestry production. She reveals the extraordinary achievement of the weavers - themselves trained as artists - who, much more than simply interpreting works, brought to each tapestry their own collaborative solutions. The Workshop pioneered interaction with aboriginal artists from early in its life, at the same time as it included leading contemporary white artists. 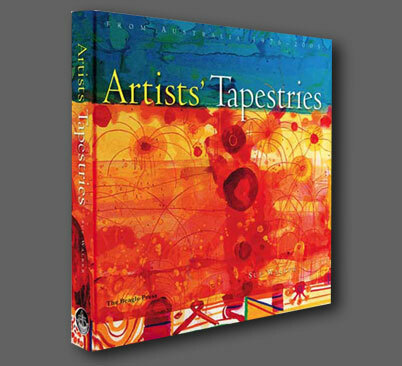 Sue Walker provides not only the public record of achievement, but focuses on the many figures who founded and fostered the Workshop, brought it into being, and sustained it in numerous ways - and on the long list of individual artists who worked with clients and weavers to produce vibrant tapestries. The book describes the remarkable and rapid success of an enterprise that grew from the imagination of artists and enlightened community leaders to become the largest creator of public art in Australia and a focus for contemporary tapestry throughout the world. The images which illustrate this story are many and ... stunning. The visual material alone makes this an exciting narrative sourcebook, combining superb reproductions of major works with comprehensive background images, coherently linked in text and captions.